We are providing Polyurethane Flooring Service to our clients. Polyurethane Flooring Service is one of the most widely used and appreciated services of our company which we are providing to our clients in almost all the regions of the country. These flooring polyurethane coatings provide an excellent durability to the floors as well as make them attractive and elegant. These PU coatings also help to make the floor waterproof and free from seeping and damp. Our clients can avail these services at our company at a very conventional and attractive range of prices. 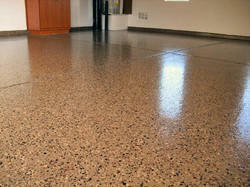 Looking for Polyurethane Flooring Service ?